I have this thing for farmhouse ladders! 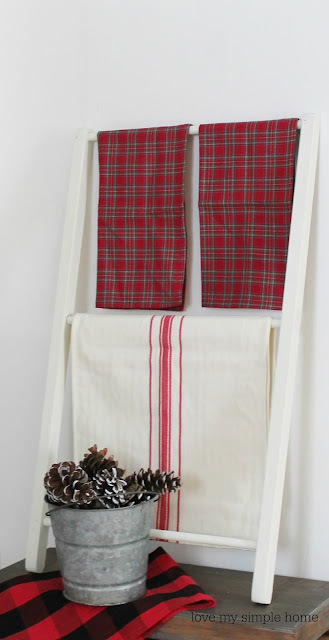 Every time I see a farmhouse ladder on Pinterest or in a magazine I know I have to have one! See how a broken down TV tray gets a simple makeover in this furniture flip. Have you heard the saying a cat has nine lives? Well, this wooden TV tray has three! I found two TV trays on the side of the road and gave them new life with paint and stencils. You can read that post here Stenciled Number Trays. After the TV tray was flipped into a farmhouse serving tray I was left with the bottom part that looked very much like a ladder to me. I became very excited because I knew I could flip this piece into one of those farmhouse ladders that I love so much! I removed the two attached legs on the side of the TV tray. As you can see from the picture below I was left with an extra long dowel. This was an easy fix. I removed the dowel by slipping it through the two holes and used a hand saw to cut the dowel to size. Then I covered the two holes with wood putty. Next, I painted the ladder with white chalk paint. I used homemade chalk paint. It is the easiest chalk paint recipe I know of. 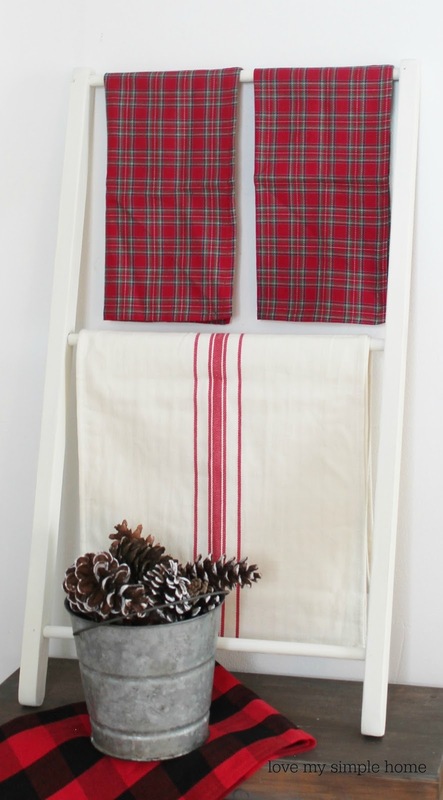 You can also find the recipe by clicking on this link Simple Chalk Paint Recipe. Now, this once unloved piece is a treasured focal point in my room! Fabulous flips! Roadside finds are the best. Thank you Linda! They are the best! Thank you so much! I love doing this sort of thing! 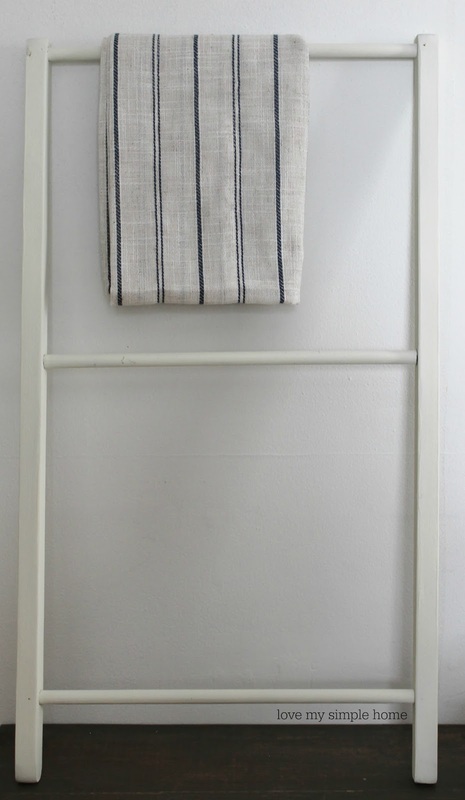 It was fun making my farmhouse ladder. So nice that you stopped by and thank you for pinning and sharing. 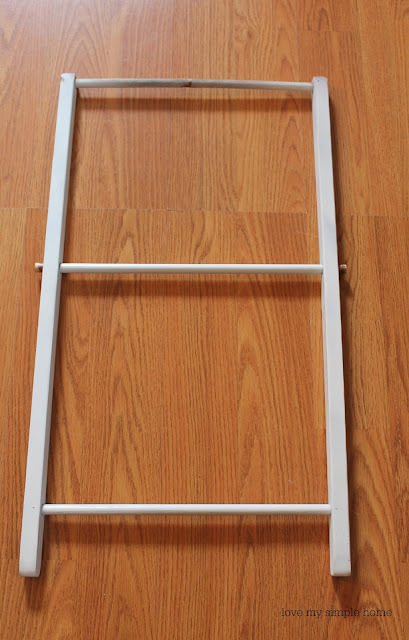 I love ladders as well, and that's a great way to reuse the leftover legs of the tv tray. Love how it turned out! I am always blown away at what you do! Thanks for the visit can't wait to meet you too!